Karl Hofer is a painter who believes you just have to stand a human figure on a canvas to arrive at humanistic art. And that that’s the only way to do it. In his effort, he’s helped out, but often also hindered by the fact that he paints in a style which renders features simplified until they’re deindividualized. His calm gaze sometimes makes for a low-key tenderness which can be very moving. But it can also develop into a pretty goofy kind of deadpan. Of course, Hofer did not invent the slight abstractedness of figure himself. He was rather mainstream in this respect, even if it is always stressed that he was a solitary on the German scene. He was handed down the mask-like face from Ensor through the Brücke painters, and gave it a touch of 1920s social caricature. While in Ensor the mask still had a clear function as the expression of an other self-estranged self, while in Picasso and early Kirchner it energized the figure through primeval forces, somewhere through the Brücke development a mask-like face became more like a batch of the recognizably modern painter, it was the done way to portray the human face, and it no longer held a deeper amount of psychology. I tell you this because, if you please, take a look at Hofer’s The Touch Of Death from 1945. This was between the carpet bombings and the Russians, and I’m not sure that I can see it the way the artist intended it, try as I might. Or what kind of comics did he read? There’s a lot of narrative, notice the still full glass of absinthe (ah! Degas, Picasso) vs. the toppled glass, the embrace of death (ah! Baldung Grien e.a. ), admire the triangular construction of lines that the gazes describe on the picture plane, from the analytical narrator directed toward his friend, then up and hitting us straight in our safe off-space in front of the image from the skull’s empty sockets, still—what for can all this art-historically informed construction work be? if the players are instructed to act the yokel in mute histrionics. We’re ahead of ourselves, though, let us go back to the time the Nazis took power. Like many a German artist who thought they were inventing a new and expressly Germanic art, Hofer was very surprised when he was classified degenerate, he thought it was all by mistake, even though he must have been aware that he had been vocal against the Third Reich. This meant from 1933 on he was barred from all exhibitions or public sales. Since he always had one or two patrons, he could continue working, and he wasn’t forced to restrict his subject matter, as e.g. Otto Dix had to, who was only allowed to paint landscapes for years. Still Hofer’s world grew very small indeed, and he’s one of the artists that are often described as staying and working in Germany during the Nazi regime in a kind of “inner emigration.” That’s a loaded term, which was used to defend those who had stayed and therefore secured their sinecures immediately after the war against those who later came back from the US or elsewhere and threw a fit because all profitable positions were already occupied and major talent wanting to come back to Germany was more or less stonewalled. Anyway, however you want to judge the term, Hofer was a near-perfect specimen of a painter in inner emigration. 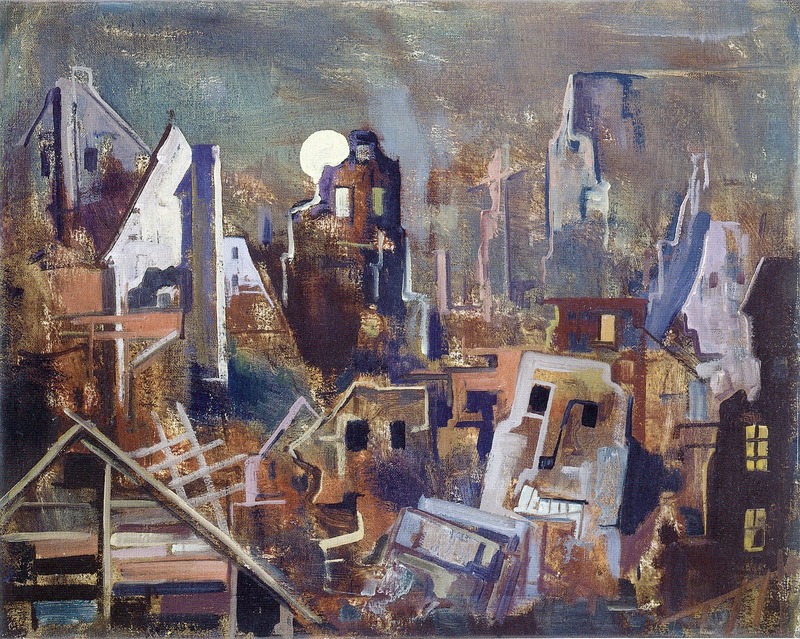 As mentioned above, he felt he and his art were deeply German, so much so that to him it was “a deadly thought” (quote) to consider leaving the country, although his situation was not bound to change for the better, and he had previous experience living abroad, in Rome and Paris, before the first war. What’s keeping him in Germany? His letters show a man who was increasingly loath to even leave his home: “I can no longer stand the bodily presence of those people,” he writes in 1943. By the end of the war, he doesn’t even accept invitations from friends. 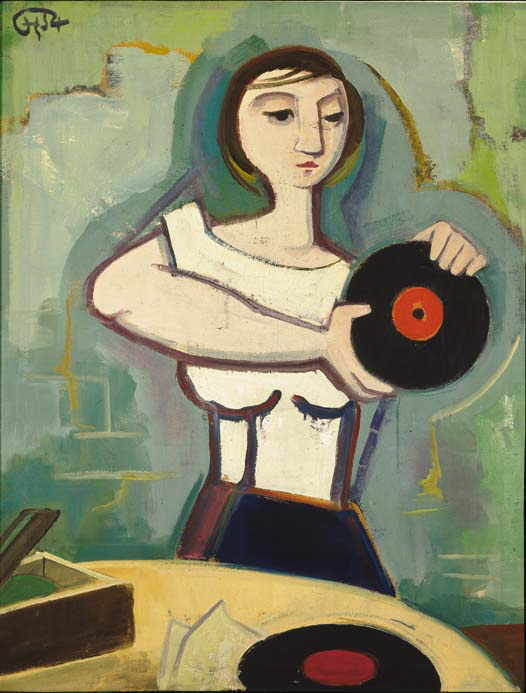 The picture that strikes me as the most emblematic work from a painter in so-called inner emigration and for the concept itself is The Record Player (literally translated simply: Girl with Record) from 1939, the year the war started. It has such touching awkwardness, such a desperate grasping after what may remain of civilization in the sorry staging of a bohemian tableau. Actually, I am not sure if that bohemian aspect was on the mind of the artist at all, I only can’t keep it from mine. Judging the wall, we’re in simple surroundings, maybe a cellar where you can listen to forbidden music at volume without the neighbors overhearing you. A gramophone and records are on the table. And there’s the girl, in a blue underdress, her right shoulderstrap carefully slipped to appear lifelike, tired eyes, hair still damp after washing. She is holding a record, presenting it like something valuable. The label looks like it could be identified, so I ask Jonathan Ward from the wonderful blog Excavated Shellac what it is, and he says it is an Odeon, a German label that used this design with the gold semi-circle around the bottom half from the 1920s to the late 1930s. By 1939 they would have been under strict Nazi control. 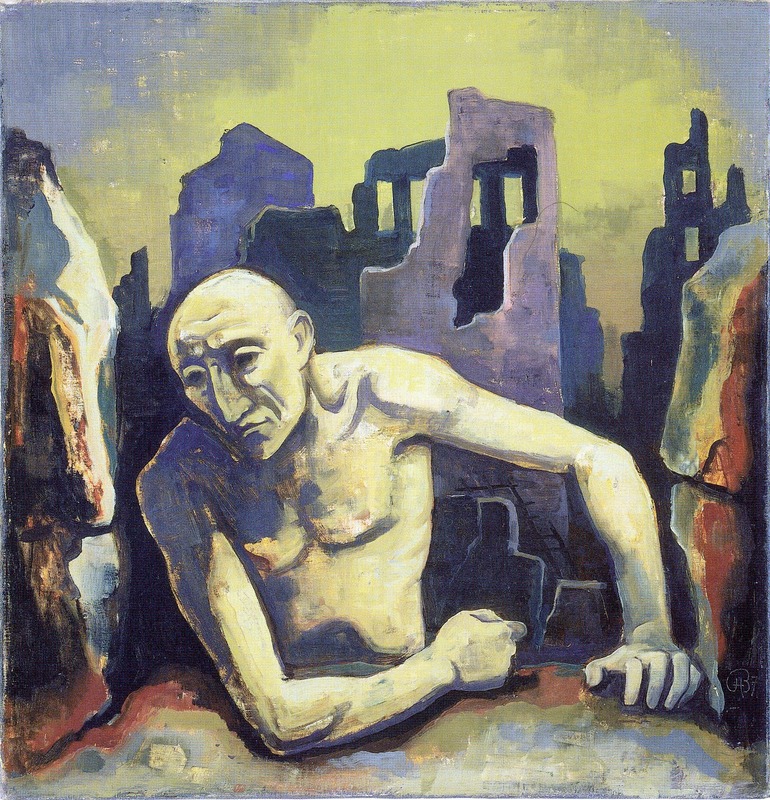 Today an internet search after Odeons that look like the one in our painting throws up that the hands-down most popular recording artist on these is Richard Tauber, the Austrian Kammersänger who had emigrated in 1938 after the Anschluss and was persona non grata in Germany (because of that and of his Jewish ancestry). Would a viewer in 1939 read the record that way? I can’t promise you, but it stands to reason. 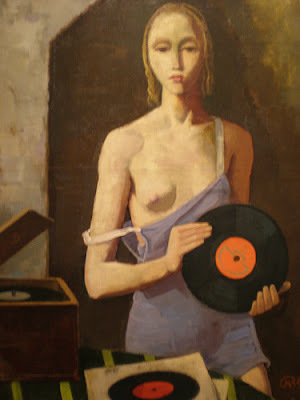 The record and the carefully bared breast, yes, they dream of Bohemia. There is unfortunately another version painted two years later, and this time Hofer gets it all wrong. Everything allows a little more of the concrete: more room in a wider frame, more carefully fleshed-out face with eyes that annoyingly want to connect, more pout, too languid a pose, too firm a body. And, worst of all, I can’t read the record label. This painting has nothing going for it really except still a slight awkwardness. Thankfully, things look up. Germany loses the war, Hofer helps reform a Berlin academy, becomes director in 1949. He bickers with the abstractionists. Or, both parties stick burning needles into screaming dolls of each other. 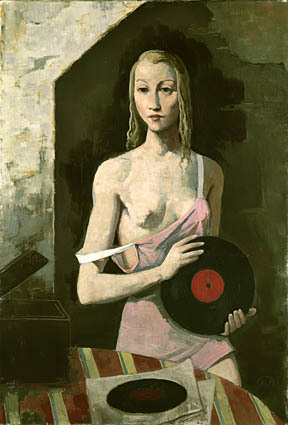 In 1954, the year before his death, Hofer paints a girl with a record again. This time around, it seems like the topic does not really register with him, the painting is about circular forms, I guess, so the records come in handy. The artist had to be occupied mostly with questions of style, since this is really the first time that his paintings change. 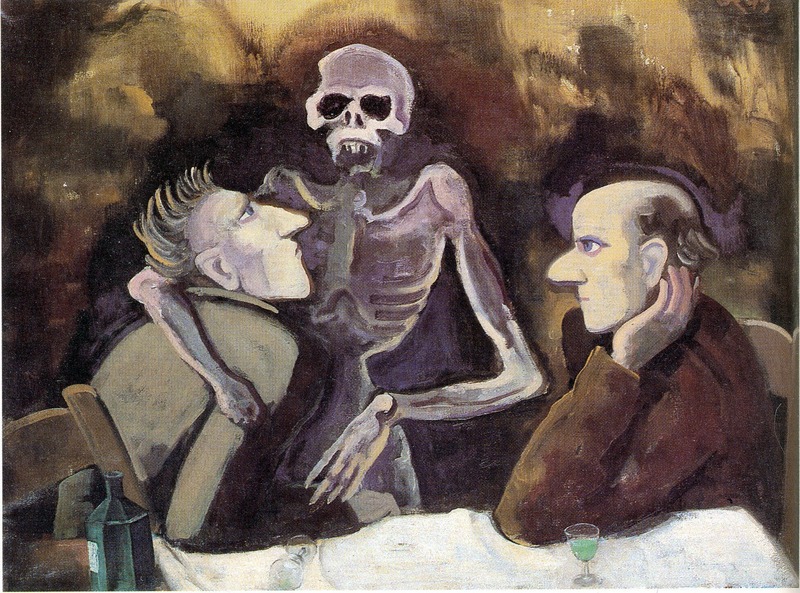 Hofer’s mature work had switched between the two closely related modes that the works shown above illustrate, sometimes a little more flat and somber, sometimes more rounded and anecdotal—but essentially from the 1920s to the 1940s he consistently and gracefully dulled down from hints of caricature to a resigned deadpan. Then suddenly, after the war, his work becomes directionless and very uneven, but open again for the times that he lives in. This girl looks so German 1950s it’s amazing—I know what her kitchen looks like (actually, there is another girl from the same period who I seem to remember grinds coffee in that kitchen, I’d show her if I could find an image, somebody out there, please? Edit: never mind, I found her). I watch the girl until I suspect she is solving the puzzle of how to open up the record, and her strength of forearm suggests that she will succeed. Outside, they clear away the ruins, the happiest beings Hofer ever painted.